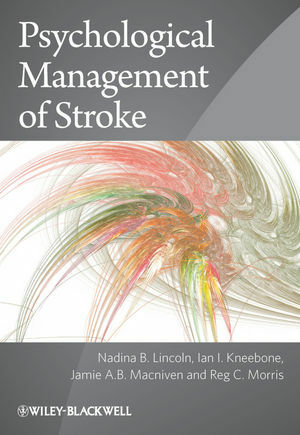 Psychological Management of Stroke presents a review and synthesis of the current theory and data relating to the assessment, treatment, and psychological aspects of stroke. Nadina Lincoln is Professor of Clinical Psychology at the University of Nottingham and Honorary Consultant Clinical Neuropsychologist at Nottingham University Hospitals NHS Trust. She has conducted an extensive programme of research to evaluate clinical stroke services. Ian Kneebone is a Consultant Clinical Psychologist and a Visiting Reader at the University of Surrey. He has published on screening measures to detect psychological problems after stroke and on psychological interventions to manage them. Jamie Macniven is a Consultant Clinical Neuropsychologist for Nottingham University Hospitals NHS Trust and Course Director of the MSc programme in clinical neuropsychology at the University of Nottingham. Reg Morris is Programme Director of the South Wales Doctorate Programme in Clinical Psychology, Honorary Professor at the Cardiff University and Consultant Clinical Psychologist in Wiltshire NHS Trust and has published widely about facets of stroke care.